Picture this… You’ve done everything right when it comes to retirement planning. You’ve scrimped, you’ve saved and you’ve maxed out your tax-free retirement accounts. Heck, you’ve even figured out the age you want to retire to maximize your benefits. You’re on the homestretch, and you’ve just begun counting down the start of your retirement journey. Then the unthinkable happens. You’re forced out of your job before you’re ready to stop working. 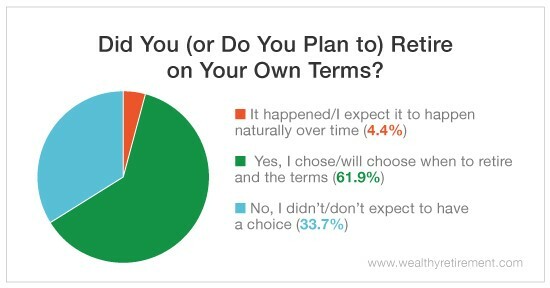 One-third of Wealthy Retirement readers surveyed said that they didn’t (or don’t expect to) choose their own retirement date. I’ve got more bad news for those of you dreaming about retirement. Finding yourself in this unfavorable situation becomes more likely when the economy heads south. Work issues aren’t the only cause of early retirements, though. Unexpected health issues also regularly force workers into earlier-than-anticipated retirements. That’s why, no matter what age you intend to retire, it’s so important to have a contingency plan. I call it your “Plan B” retirement. Here are a few steps you should take to make your early retirement transition easier. One of your actions should be finding out what benefits you’re eligible for and how to take advantage of them. You might be eligible for unemployment. Since you’ve paid into it all these years, there’s no shame in taking it. If your health forced you to retire early, you could be eligible for disability benefits. The extra income can help pad your transition to early retirement. Health insurance coverage is another priority. If you’re 65 years old or older, you might be eligible for Medicare. If not, you may want to explore insurance options under your former employer’s COBRA, or compliance with the Consolidated Omnibus Budget Reconciliation Act. COBRA allows you to stay in your former employer’s group health insurance plan for up to 18 months. It’s not cheap, though. You’ll have to pay the full cost. Finally, don’t forget to check out policies offered by health insurance exchanges. You may find a cheaper option than COBRA. Social Security is another benefit to consider, but you’ll want to do your research. If you tap into it before your full retirement age, you’ll be throwing away thousands of dollars a year. If you can cover your bills with funds from other sources, it likely makes sense to wait. Once you have your transition period covered, you’ll be in good shape to reimagine your original retirement fund. At this point, it’s a good idea to review your investments and budget to figure out how long your money will last. You may want to think about cutting expenses to make your original plan work, or you might want to consider a consulting gig or part-time job to help supplement your retirement income. Not all surprises are good ones. But you can handle almost anything if you’re prepared. An early retirement doesn’t have to be the end of your retirement dreams if you know how to readjust.